The Inner Mongolia Autonomous Region is situated 97"12"-126"04" east longitude and 37"24"-53"23" north latitude with an area of 1.183 million square kilometers, taking up 1/8 of that of the country and ranking the 3rd in China. Inner Mongolia has not only a large area but also geographical advantages, bordering Heilongjiang, Liaoning, Jilin, Hebei, Shanxi, Shaanxi, and Gansu provinces as well as Ningxia Hui Autonomous Region in the east, south and west. It spans the northeast, north and northwest of China and borders Russia and Mongolia in the north with a boundary line as long as 4,221 kilometers, thus becoming am important frontier for China's opening to the outside world. Inner Mongolia, with a temperate continental monsoonal climate, has a cold, long winter with frequent blizzards and a warm, short summer. 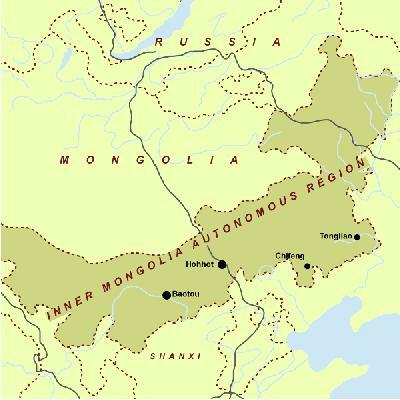 Except for the relatively humid Greater Hinggan Mountain Area, the greater part of Inner Mongolia is arid, semi-arid and semi-humid from west to east. It has a mean annual temperature of -1oC-15oC -- the hottest month, July, averaging 15-25oC and the coldest month, January, -30-10oC -- and a mean annual precipitation of 100-500 mm. The difference of temperature between day and night is great. It is divided into 5 leagues, 7 prefecture-level cities, 49 banners, 3 autonomous banners, 17 counties, 15 county-level cities and 17 districts, with a population of 23.76 million as of the year 2000. Roast lamb, Instant-boiled mutton, finger mutton and milk tea, etc. Mongolians like singing and dancing. The Inner Mongolia Autonomous Region is also called Inner Mongolia for short, with Hohhot as its capital city. Its origin can be traced back to the Ordos people who lived here 2,000 years ago. With agriculture and stockbreeding as the main occupation, it also engages in forestry, coal mining and steel industries. Inner Mongolia abounds in natural resources especially mineral resources, and its reserves of rare earth and natural alkali rank first in China. Inner Mongolia is a special economic zone renowned as "treasure basin". What is most attractive about Inner Mongolia is its natural beauty. Vast grasslands, mushroom-like yurts, bright sky, fresh air, rolling grass and the flocks and herds moving like white clouds on the remote grassland, all contribute to make the scenery a very relaxing one. The Greater Hinggan Mountain, renowned as the green treasure, is the largest and well-preserved primitive forest and also the Kingdom of Wildlife, with over 300 species of birds and 100 species of animals, 40 of which are listed among the national rare species. Inner Mongolia is an area of multiple ethnic groups with 3.77 million Mongolians, 17.6 million Hans and over 900,000 people of other ethnic minority groups. It is the first autonomous region of China established in 1947. People of various ethnic groups all have long histories and brilliant cultures. The places of interest are Zhaojun Tomb in Hohhot, the Five-towers Temple, the Wudangzhao Monastery, and the Genghis Khan Mausoleum in Yijinhuoluo. The traditional special local products include pure wool coarse string, Alashan camel's hair, Xilin Gol mushroom and Hetao melon.